FAQ: Should I drink Gatorade for my diarrhea? One of the most frequently asked questions I receive, is, “Should I drink Gatorade for my diarrhea?” My short answer is: No. Unless that’s all you have on hand. 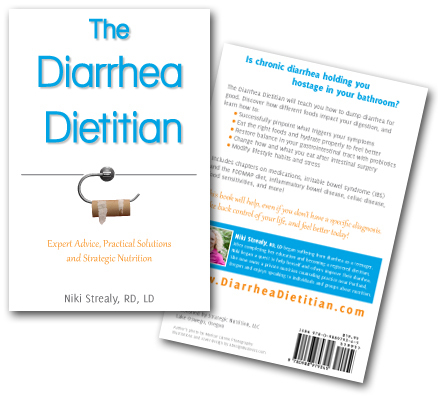 Read the following excerpt from Chapter 17 of my book, “The Diarrhea Dietitian: Expert Advice, Practical Solutions, and Strategic Nutrition”. 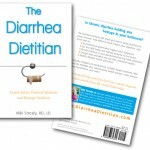 My patients with chronic diarrhea often complain of fatigue and exhaustion. In my experience, this is often due to dehydration, or inadequate water and electrolytes in the body. Those with inflammatory diarrhea (e.g. Crohn’s disease, ulcerative colitis) or secretory diarrhea (e.g. carcinoid syndrome, Clostridium difficile) may have extreme losses of fluid and electrolytes, leading to a dangerous form of dehydration that can be life threatening. Sodium is plentiful in the foods that we eat—and combined with chloride—in the form of salt. Salt is added to processed, canned, frozen, and fast foods to extend shelf life and improve taste. While uncommon, those with chronic diarrhea can be at risk for hyponatremia, or low blood levels of sodium, due to extra losses from the stool. Potassium is important for muscle and nerve cells. Low potassium in the blood, called hypokalemia, can be life-threatening. Severe hypokalemia often requires hospitalization and intravenous (IV) replacement. If you ever have any of the symptoms for low sodium or potassium, please contact your medical provider immediately. If you have chronic diarrhea, ensuring the diet includes adequate amounts of sodium and potassium is fairly simple. As previously mentioned, sodium is easy to find in food. Salty crackers and soups are favorite sodium replacements for many of my patients. Replacing potassium is a little trickier. Foods that contain high amounts of potassium include spinach, potatoes, tomatoes, citrus fruits, melons, bananas, dairy products, dried peas and beans, nuts, and chocolate. However, many of these foods are not tolerated by those with intestinal problems, so electrolyte beverages and replacements may be a better alternative. Many people with chronic diarrhea treat their dehydration with sports drinks such as Gatorade®. Sports drinks are formulated to replace electrolytes lost in sweat during exercise. The quantities of sodium and potassium are not high enough to replace those lost by chronic diarrhea. Nevertheless, sports drinks may work for those with mild diarrhea, or if you are unable to access a better alternative. 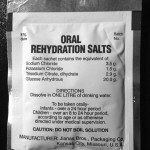 Oral rehydration solutions (ORS) are beverages formulated especially for diarrhea. The World Health Organization (WHO) has studied and used oral rehydration solutions extensively in Third World countries for many years to treat severe diarrhea such as colera. In developing countries, untreated diarrhea in children, elderly, and the immune-compromised can be life-threatening. 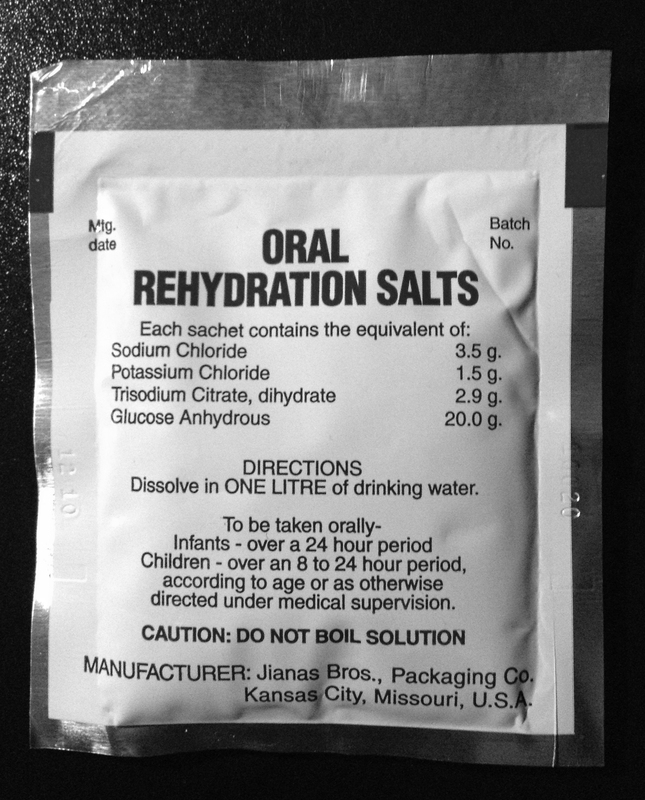 WHO developed a formula for oral rehydration salts that is relatively inexpensive to produce and distribute. This oral powder comes in individual packets that dissolve in one liter of clean drinking water. You can also add sugar-free Crystal Light (I prefer lemonade flavor) or other sugar-free powdered beverage mix to improve taste. One of the difficulties in assessing ORS is identifying the quantities of sodium and potassium in a given volume. Sports drinks commonly list sodium and potassium in milligrams, whereas medical solutions list milliequivalents (mEq) per liter of solution. A conversion is required to convert mEq to milligrams. The goal is to keep rehydration solutions as close as possible to a normal plasma osmolality of 285-295 milli-osmoles per kilogram, in order to maximize absorption and prevent osmotic diarrhea. Do not worry about the exact number. It is more important to realize the higher the osmolality, the greater the chance of osmotic diarrhea. Something you may notice about both oral rehydration solutions and most sports drinks is that they both contain some form of sugar, usually in the form of glucose. When glucose is present, sodium and potassium absorption is increased. Therefore, rehydration beverages containing all three components—sodium, potassium and glucose—are recommended. When I recommend electrolyte replacement, it depends on the frequency and severity of the diarrhea. If one of my clients with chronic diarrhea complains about ongoing fatigue and severe diarrhea (15-25 trips to the bathroom each day), I recommend aggressive replacement of fluid and electrolytes with an ORS. People with three or four stools per day may be able to use sports drinks or electrolyte-enhanced water, supplementing with ORS as needed.